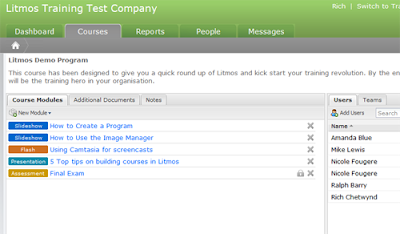 Litmos Version 3.0 is aimed at improving the user experience for course administrators. Over the past few months our development team have been working closely with usability consultants to bring increased clarity to the Litmos User Interface (UI). It's all about making the Learning Professional's life easier by making processes of creating, assigning and managing courses more efficient. It's also important to note that the changes to the user interface in V3.0 will only been seen by training administrators. Your trainees and students will continue to see the same familiar Litmos interface. One example of this is faster course assignment. Assigning a course to a new user used to take in excess of 10 clicks. It now takes just 2. Here is a sneak preview of the new version's look and feel.